The AB1016 Autobrake provides accuracy and repeatability when forming up to 10ft long 16 gauge or lighter materials. 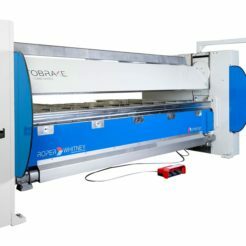 This sheet metal brake is a high speed solution to make multiple bends while maintaining a high quality level in the end product. Both backgauge options provide accurate part location through the use of servo drives and are expandable with optional backgauge extensions. 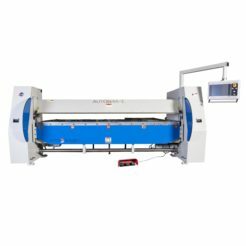 The rigid design includes crowning adjustments to ensure accurate bending regardless of raw material stresses. Various options of tooling are provided to help customize to your specific needs, and can be provided in tool steel or hardened. The Autobrake 1014 provides accuracy and repeatability when forming 14 gauge or lighter materials. 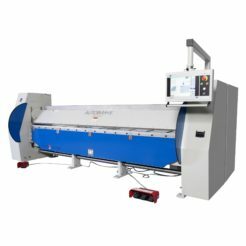 This sheet metal brake is a high speed solution to make multiple bends while maintaining a high quality level in the end product. Both backgauge options provide accurate part location through the use of servo drives and are expandable with optional backgauge extensions. The rigid design includes crowning adjustments to ensure accurate bending regardless of raw material stresses. Various options of tooling are provided to help customize to your specific needs, and can be provided in tool steel or hardened. The 1014K includes all of the benefits of the standard AutoBrake, but also incorporates a rotating Kombi beam making this machine even more versatile. This unique tooling assembly adds to the machine?s straight and box folding capabilities to produce more complex shapes in less time. It handles a wide range of materials, easily closes hems and withstands the force generated by maximum capacity forming operations. The AB1011 Autobrake provides accuracy and repeatability when forming up to 10 feet of 11 gauge mild steel or lighter materials. 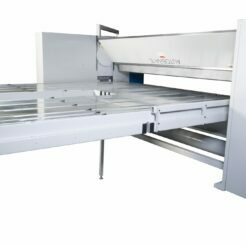 This sheet metal brake is a high speed solution to make multiple bends while maintaining a high quality level in the end product. Both backgauge options provide accurate part location through the use of servo drives and are expandable with optional backgauge extensions. 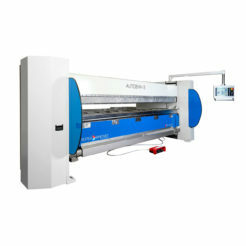 The rigid design includes automated crowning adjustments to ensure accurate bending regardless of raw material stresses. Various options of tooling are provided to help customize to your specific needs, and are provided by Wilson Tool. The heavy-duty AB1009K Autobrake provides accuracy and repeatability when forming up to 10ft long 9 gauge or lighter materials. 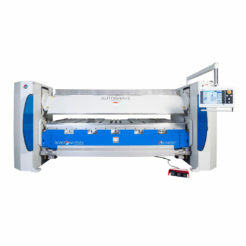 It is a high-speed solution to make multiple bends while maintaining a high quality level in your end product. Both backgauge options provide accurate part location through the use of servo drives and are expandable with optional backgauge extensions. 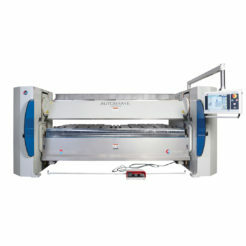 Its rigid design includes automated crowning adjustments to ensure accurate bending regardless of raw material stresses. 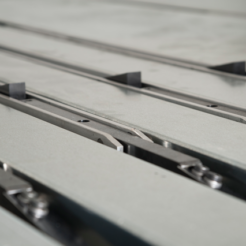 Tooling options are provided to help customize to your specific needs, and can be provided in tool steel or hardened. The Autobrake 1212 provides accuracy and repeatability when forming 12 gauge mild steel and 16 gauge stainless steel. 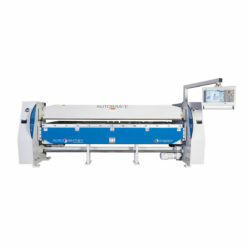 It features the rotating Kombi beam, which expands the machine’s folding capabilities to produce straight to box and pan bending in just 11 seconds. 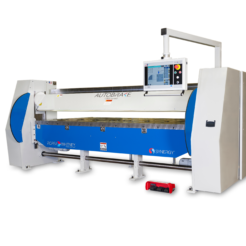 The box tooling is 6.3″ in height, precision ground and laser hardened to 60. Pieces are also laser etched with the length of the tool for easy box set up. The Autobrake 1214 provides accuracy and repeatability when forming up to 12ft long 14 gauge or lighter materials. 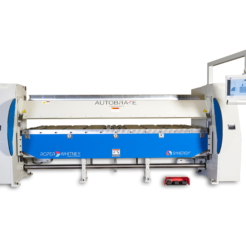 This sheet metal brake is a high speed solution to make multiple bends while maintaining a high quality level in the end product. Both backgauge options provide accurate part location through the use of servo drives and are expandable with optional backgauge extensions. The rigid design includes crowning adjustments to ensure accurate bending regardless of raw material stresses. Various options of tooling are provided to help customize to your specific needs, and can be provided in tool steel or hardened.